Funk Volume co-founders, Hopsin and Dame Ritter are learning that lesson first-hand. Initially, the pairing of Hopsin’s music and Ritter’s corporate mind made sense. However, Hopsin has since accused Dame of having gambling problems and becoming power hungry as all hell. 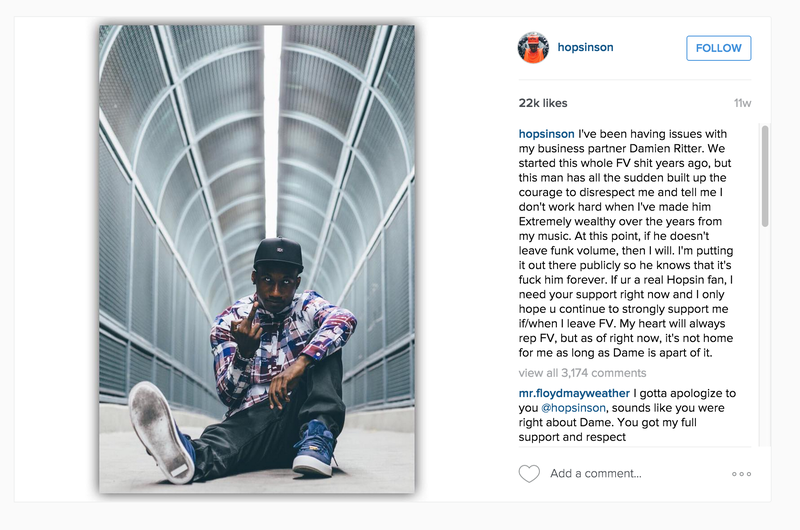 The creation of Funk Volume Fitness and the signed distribution deal with Warner Bros. Records did not sit well with Hopsin, a veteran of independent labels. Although Hopsin publicly voiced his displeasure with Funk Volume in early January, his eventual departure was a shock to the hip hop community. While former label mate Dizzy Wright blames the incident on a miscommunication, Hopsin has denied these claims. Ritter has stated that Hopsin’s work ethic was the final nail in Funk Volume’s coffin. The fifteen year rap veteran is best known for his Ill Mind of Hopsin series, drawing a combined 147 million views on his Youtube channel. His most recent effort, Pound Syndrome, debuted at a career-high at #17 on the US Billboard 200 in July 2015. Without Funk Volume, it remains to be seen if Hop’s next album will break that milestone. Since the label’s dissolution, Hopsin has founded Undercover Prodigy in its place. To date, he is the only artist currently part of the label. Having parted ways with both Ruthless Records and Funk Volume on bad terms, one can only wonder if the third time’s a charm for the outspoken 30-year old.